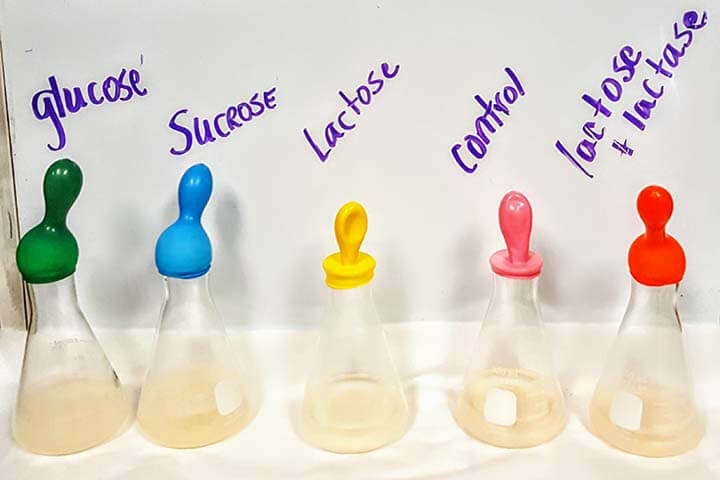 Demonstration: Can Yeast Digest Lactose? This activity can be performed as student lead inquiry lab or as a class demonstration activity. Students should have a basic understanding of how enzymes work and the relationship between lactose and lactase. If you use Openstax, this is a great lesson to bridge the chapter on enzymes to the next one on respiration and metabolism. After discussing lactose-persistence in humans or after students have completed the HHMI investigation “Got Lactose,” ask students this question. Do you think yeast can digest milk? Give students time to think about the question and form reasoning for their answer, ask for sharing from volunteers. Ask students to work in small groups to design an experiment to answer the question. At this point, you should provide them with some clues. Show students materials that could be used. Because I don’t normally have enough flasks for all the students, I usually do this one is a demonstration, but students could set this up on their own. Make a stock solution of yeast, about 5 g to 500 ml of warm water. Distribute across four Erlenmeyer flasks. A fifth flask can be used as a control. Place a balloon on each flask. If you can use a warm water bath, this will speed up the reactions, though some changes should be visible within 20 minutes. Leave overnight for more dramatic changes. Have students make observations and develop a CER chart that explains what happened and answers the experimental question. The balloons inflate as yeast consumes glucose and releases carbon dioxide (glycolysis). Inflation will occur with glucose and sucrose, but not with lactose. Yeast do not have the lactase enzyme and cannot break down lactose. If you add lactaid, lactose will be broken down into glucose and galactose, which can be used by the yeast. What is in the control group? The control only has the yeast in it, so there is no nutrient source (glucose). Glycolysis does not happen, the balloon will not inflate. How much glucose, lactose, sucrose are you putting in each flask? I tried this and got no reaction in any of them (did 5g/500mL yeast). I used 5g of each nutrient.